Thank you Ghastly for the picture ! a new line medium tanks of sovyet or just another reward MT of clan war ?? I hope it’s fake. We seriously don’t need more Russian tanks. It’s not War Thunder. We can’t have too many russian tanks. Unless they are swapping out the current T-62A, with it we don’t need it. Smoothbore? Isn‘t that one of the taboos in WoT? Smoothbore and Compositearmor? We already have like 1300m/s APCR firing “rifled” pixel guns, so what would be so revolutionary in a “smoothbore” virtual cannon? That so called composite on the T-62M is more like spaced armor with a bit of plastic in between, working in a similar way as the Super Plonkeror burster plate and as such not much to write home about in terms of kinetic rounds. I don’t bother shooting at hull-down rusky meds anyway, unless I am above them and can shoot down into the top of the turret. Even if the frontal hull gets increased from a 100 to 120mm, the protection will be just on par with the T-54, which is nothing special at Tier X. Gun should be somewhat derpier around 0.40-42 accuracy with good soft stats. So… somewhat better turret againt prem spam, bit better trading capacity do to higher alpha at the cost of accuracy and reload time. Might aswell add the Leopard 1 with it’s added armor aswell then I guess. I mean, if they’re gona add a tank design from 1983. I mean, the A3s armor was upgraded in 1974, well before the T62M. Maybe even the Leopard 2 prototypes. My apologies. Sebastianul sent me the video and your picture to post “as soon as possible”. I had no clear idea who took the picture so I assumed it was him and not you. In any case, I edited the post and you now are properly credited. My apologies. Sebastianul sent me the video and the picture to post “as soon as possible”. I had no clear idea who took the picture so I assumed it was him and not Ghastly, hence why I didn’t credit him back then. In any case, I edited the post and he’s now properly credited for his picture. By speaking of “fake” (because blaming your fast and narrow-minded conclusion wouldn’t be nice 😛 ), I don’t get why the thumbnail of the T-62M is like that, I mean, in a different fashion from all the other hangar tank thumbnails (just look at the T-62A right above). 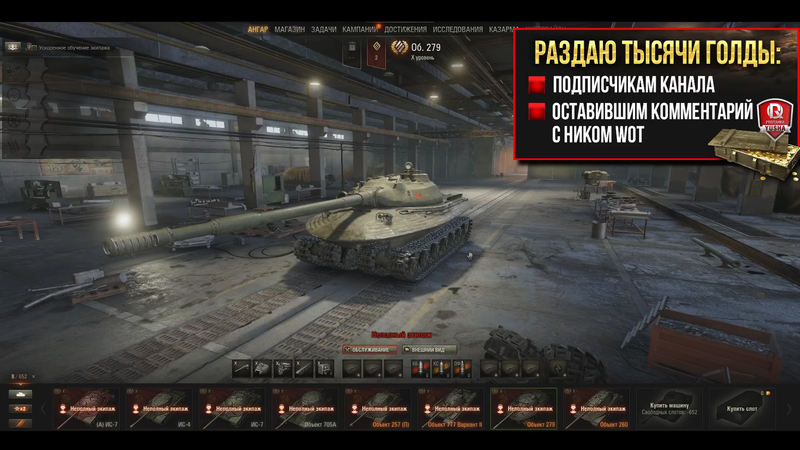 Not even that Object 279 hangar picture had that kind of thumbnail. I tend to see it as fake due to the fact the thumbnail picture is different from all the other ones… EVen the Object 279 picture had the same style of thumbnail (look at my answer above to Inadequate_xdddd for it, I’m not going to spam the comments with it). WoT already has multithreaded rendering. It was added in one of the 9.X patches. They are just adding more threads to the graphics part of the game engine. However they don’t make it completely clear in the video. The Topic here was Multi Threading of processors for PC’s?